Hi friends and Happy New Year! I hope you're all doing well. I wanted to take this opportunity to thank all of you for your continued support and for helping to make 2008 a great year for me. I truly appreciate all the comments I receive on here as well as all the emails I get. It really means a lot to me! I know that I am sometimes not the best at getting back to everyone, but I do read every email I receive and will sincerely try to get back to everyone soon. As I look ahead to 2009, I am excited about several upcoming projects and ideas that I hope to work on this year. Although the robot posts will continue (and I'll continue to draw them! 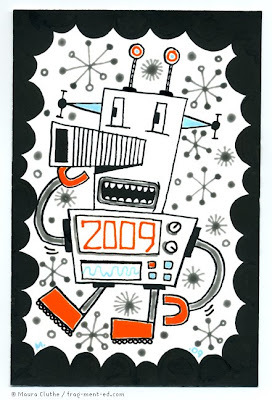 ), I am excited about to announce that 2009 is the Year of the HYPER DOODLE. If you look at the tags to this post, you'll see that I've added a new "hyperdoodle" tag. As I was looking through the pieces that I did last year, I noticed that I've been doing a lot of these hyper doodles lately. Many of my ideas for 2009 revolve around this theme. I'm excited to see where this leads...! happy new year Maura! i love the name 'hyper doodle'. hee. sounds like a good theme for the new year. and man! that robot clock rocks!! !